Proper footwear is an important part of an overall treatment program for people with diabetes, even for those in the earliest stages of the disease. If there is any evidence of neuropathy, or numbness, wearing the right footwear is crucial. View some of the diabetic shoes we dispense in our office. 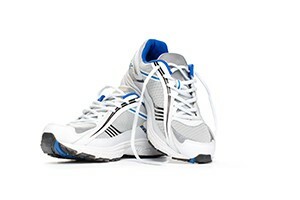 Read a January 25, 2012 AP article about the benefits of diabetic shoes. There are a number of shoes on the market that are designed for protection and relief from bunions, heel bruises, arthritis pain and other foot conditions and irregularities. Link here for more information on the therapeutic footwear we often recommend. Limit motion of joints. Limiting the motion of certain joints in the foot can often decrease inflammation, relieve pain, and result in a more stable and functional foot. Custom-made shoes. When extremely severe deformities are present, a custom-made shoe can be constructed from a cast or model of the patient's foot. These cases are rare. With extensive modifications of in-depth shoes, even the most severe deformities can usually be accommodated. External shoe modifications. This involves modifying the outside of the shoe in some way, such as modifying the shape of the sole or adding shock-absorbing or stabilizing materials. Healing shoes. Immediately following surgery or ulcer treatment, some type of shoe may be necessary before a regular shoe can be worn. These include custom sandals (open toe), heat-moldable healing shoes (closed toe), and post-operative shoes. In-depth shoes. The in-depth shoe is the basis for most footwear prescriptions. It is generally an oxford-type or athletic shoe with an additional 1/4- to 1/2-inch of depth throughout the shoe, allowing extra volume to accommodate any needed inserts or orthoses, as well as deformities commonly associated with a diabetic foot. In-depth shoes also tend to be light in weight, have shock-absorbing soles, and come in a wide range of shapes and sizes to accommodate virtually any foot. Link here for more information about the diabetic shoes Dr. Merrill prescribes and are depensed from our office. Orthoses or inserts. An orthosis is a removable insole which provides pressure relief and shock absorption. Both pre-made and custom-made orthoses or inserts are commonly prescribed for patients with diabetes, including a special "total contact orthosis," which is made from a model of your foot and offers a high level of comfort and pressure relief.